Bluebird Springs Park is a small but scenic county-owned property, with easy access to search for migratory songbirds in spring and fall and a suite of resident species all year. The park is best during migration but a visit at any time of the year will keep you busy for an hour or so. The spring itself is surrounded by wet, broadleaf forest. A paved, wheelchair-friendly trail winds through an open grassy area around two sides of the spring. Belted Kingfishers, Anhingas, Great Blue Herons, and Wood Ducks may be present. In spring and fall, check the forest edges for Orchard Orioles, and mixed warbler flocks, plus resident species such as Downy Woodpeckers, Northern Cardinals, Blue Jays, Blue-gray Gnatcatchers, and White-eyed Vireos. Eastern Bluebirds nest in boxes here; look for Phaon crescent butterflies around the spring. 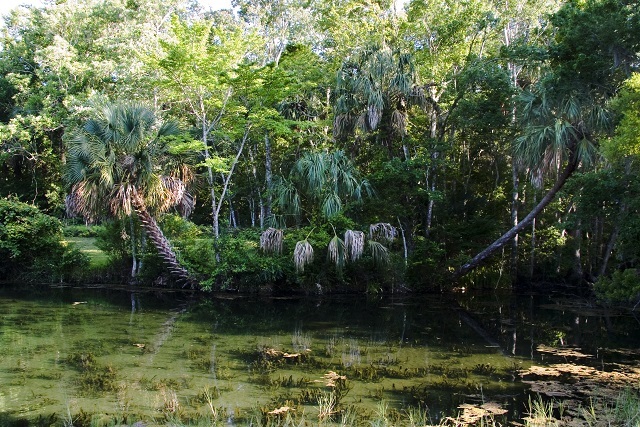 A brief walking trail leads from the southeast corner of the spring into the hammock and terminates at a wetland. Bring lunch and take advantage of the picnic tables before and/or after you have checked to see what birds are around.